Our standard fine selected Bluefaced Leicester blended with white tussah silk. A luxury blend of the finest Bluefaced Leicester with white Tussah silk. 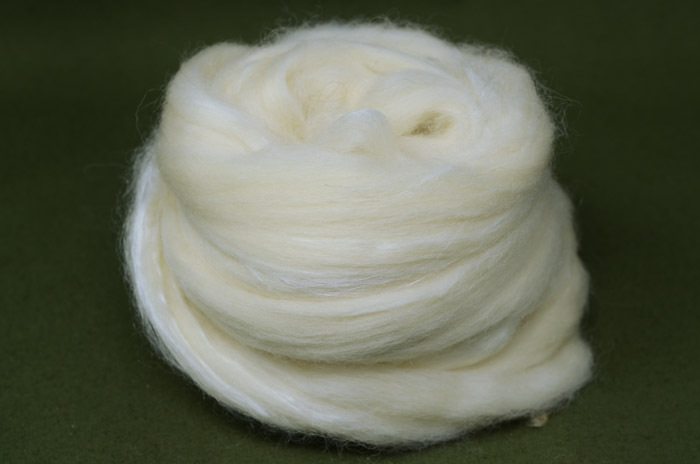 The lustre of the Bluefaced blends really well with the silk and is quite easy to spin. Both fibres in the combination dye easily with Landscape dyes, the silk takes the dye slightly differently to give a very interesting effect. For felting the effect is the wool shrinks and the silk does'nt giving a crinkle effect from the silk. You can make a quick scarf by simply taking a long length of the tops spreading it sideways and wet felting it.